Ninety thousand Michigan soldiers fought in the American Civil War — 15,000 making the ultimate sacrifice. The bullet torn, blood stained battle flags that these men carried and died beneath were their proudest possessions — they stood for the Union and were the rallying point in combat. The Capitol was designed in part to serve as an honorable and safe repository for the flags. In later years, flags carried during the Spanish American War and World War I joined the Capitol Battle Flag Collection, now totaling 240 banners. In 1990 Save The Flags, a taskforce dedicated to preserving and researching these incredible artifacts, was created. Based on the recommendation of the task force, these Capitol artifacts are now housed in a special archival unit at the Michigan Historical Center in Lansing. Learn more about the collection and trace the history of the flags from the battlefield to the Capitol and eventually to the museum through our flag timeline. Learn about the ongoing efforts to preserve and research the collection including information on how you can help through our “adopt” a flag program. Gallery of the images from three different collections of battle flags including brief information on each flag and the regiment that carried it into battle. Also learn about flag storage and read more indepth information about the regiments. Find links here to other sites that include information about our collection, including educational productions/video programs featuring the battle flags. 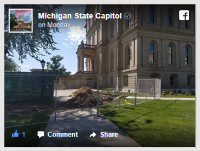 Keep informed of upcoming Capitol Battle Flag presentations and events. Contact information for Save the Flags can be found on the Save the Flags page. 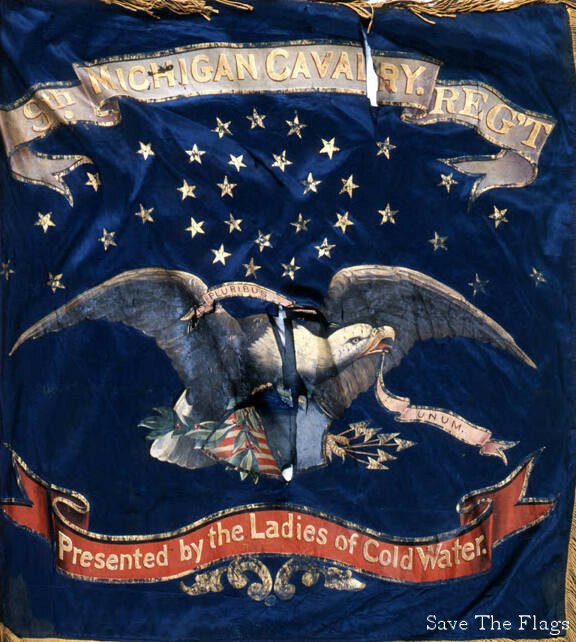 This flag was presented to the Ninth Michigan Volunteer Cavalry Regiment when its men were mustered in during 1863 in Coldwater. Writing in 1876, Adjutant General John Robertson described the flag as a "very neat and finely lettered silk standard, with the United States arms on one side, and on the other that of the State, with the inscription: ‘Presented by the ladies of Coldwater.' The Flag passed through many hard battlefields, but was carefully guarded and well defended."